Just fifteen days before the Tory Administration is expected to unveil a Council Tax rise, the Leader of the Council, Councillor Kevin Davis, is booked to attend MIPIM – an international property market conference on the French Riviera. The confirmed bill for the Leader to attend the shindig and meet property developers is £4,014. “This is not a good time to be clinking glasses in the South of France! I think Kevin Davis should be sorting out the budgets problems in the borough rather than attending this conference." "Kevin Davis' free trip to Cannes is nothing more than a jolly for developers and again it raises more questions about the 'cosy' relationship between developers and the council." 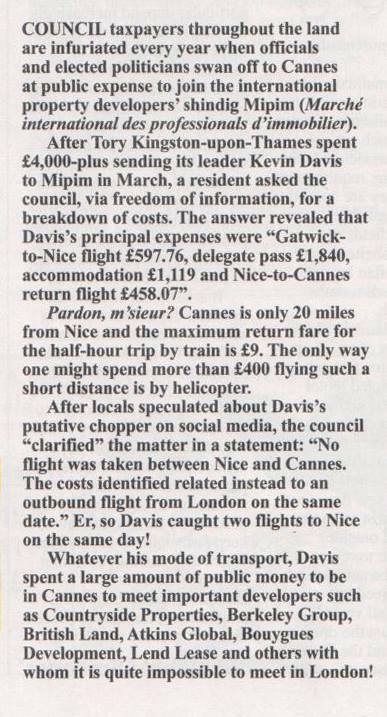 Kevin Davis' trip to Cannes at council taxpayers' expense has captured the attention of Private Eye magazine.